For decades, the consumer’s home was monetized by hardware (TV, computers) and content subscription (cable) business models. Much less so software or data. This is about to end. The home is being “eaten” by software (and data) as is the rest of the world. It is the next major battleground for tech’s giants, and the reason behind Google’s Nest Acquisition. The battle cries started in your smartphone but are soon to resonate in your HVAC, entertainment, appliance, security and other systems. 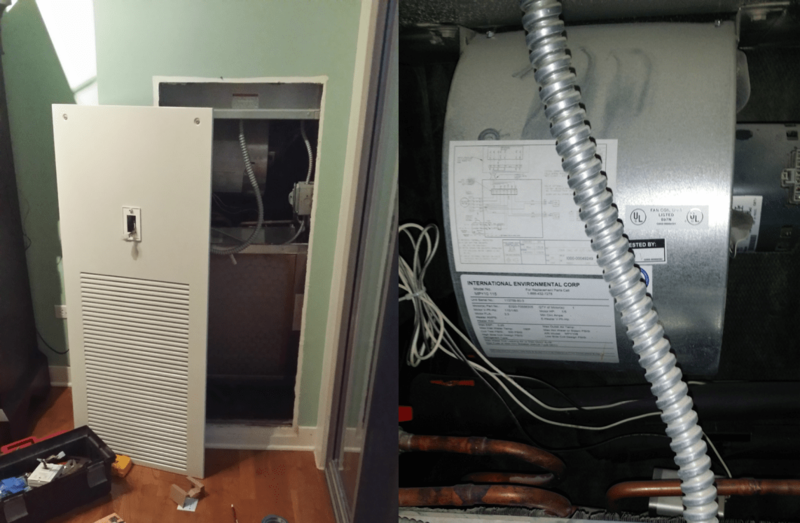 This is a story in vignettes about my inviting the battle into my home – my journey installing nest (and nearly failing) in a four-pipe 120V fan coil system* and what I learned about the changing world and myself. *You tech readers will pardon my geekiness. Hoping some of the home hackers (ugh, such a YC word) will find use in the technical stuff in here. 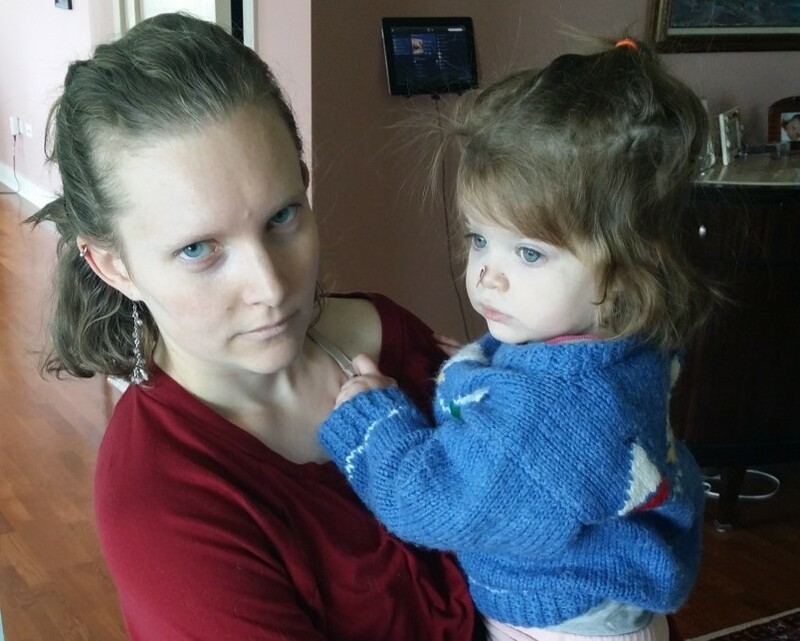 You home hackers will pardon my ruminations on the tech world. I’ve had a nagging need to build and make things since I was a kid. Hours in my dad’s shop led to furniture building school after high school and an early career as an engineer. Being a VC scratches all my itches of curiosity, short attention span, excitement and working with amazing people… but I don’t build anything. I serve others in their own journey to build, which I love, but my hands still feel empty. So I cherish the opportunity to pull wires out of my apartment’s walls and see what I can do. Over lunch with @harper Reed and @dylanr Richards, we chatted on the growing home automation trend, consumer’s willingness (or not) to pay for home software models and our respective forays into the trend. We all seemed to have Sonos, some chosen standard, (Zigbee, Z-wave) and some version of a home automation hub (Vera, Revolv, SmartThings etc) but I was the laggard on nest. 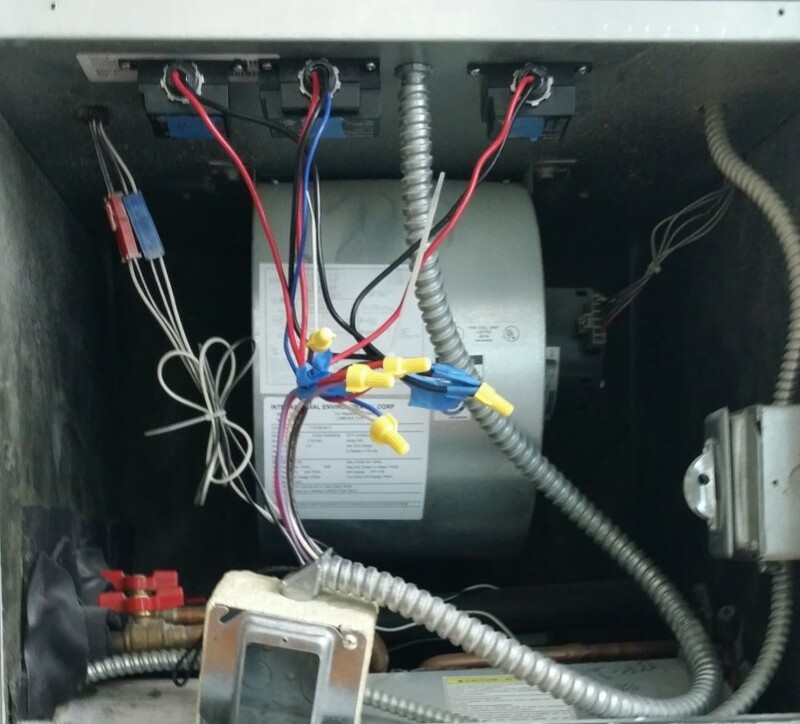 Nest was designed for 24V controlled systems, not for the 120-240V systems often found in commercial and high rise building… like mine. I’d been doing some research. My system was not supported by nest and would require multiple relays, a transformer and altering a high voltage system – aka, a big hack. Harper’s response: “Sounds like you should get some relays”. This is why I love entrepreneurs. The best ones just go do it. Time to learn! To the internets! 15 years ago, I would have spent weeks calling suppliers, visiting electrical suppliers and eventually hiring an electrician. Now, with three hours of googling on my couch in my boxers, I was inductively assembling the vast collective knowledge of others who came before me. But it was damn confusing. 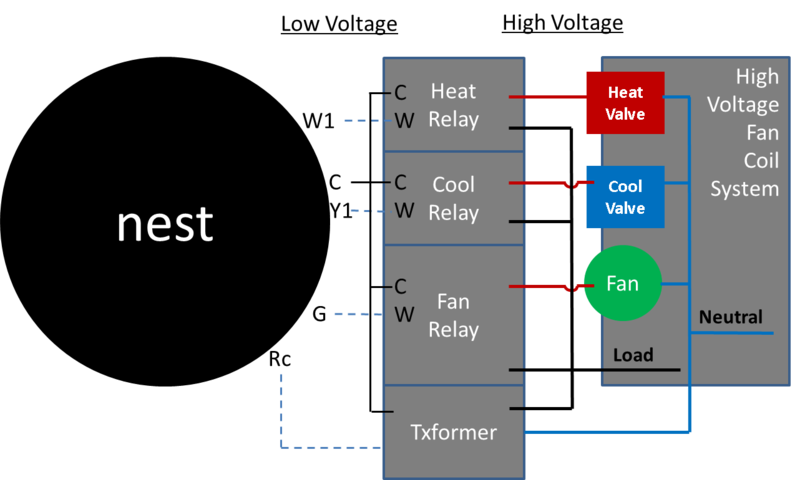 There were hints about how to hack a 240V or 120V system for nest – good discussions and overviews here and here – but nothing complete. Whoever can solve this problem of tying all of the world’s increasingly available but disconnected-and-of-varying-quality information together will build the first trillion dollar company. This may be Google, we’ll see. We just weren’t meant to process this much available information; we need help. Human beings standing upright was paradigm changing, but it also caused millennia of lower back pain. Limitless information will change us forever – mostly for good but not without side effects. 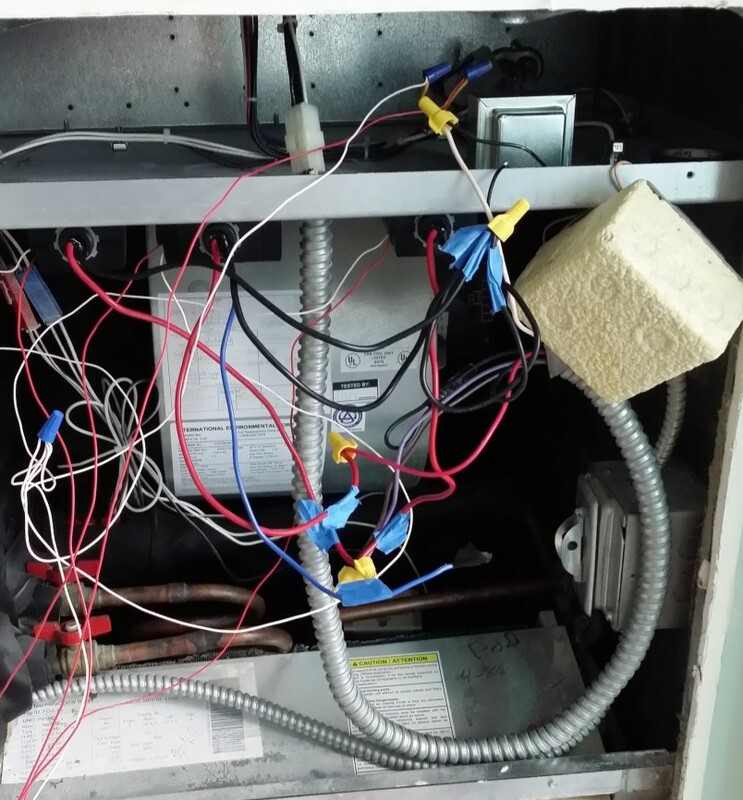 Here’s a shot of my fan coil system – big view and close-up of the fan, coil and pipes. 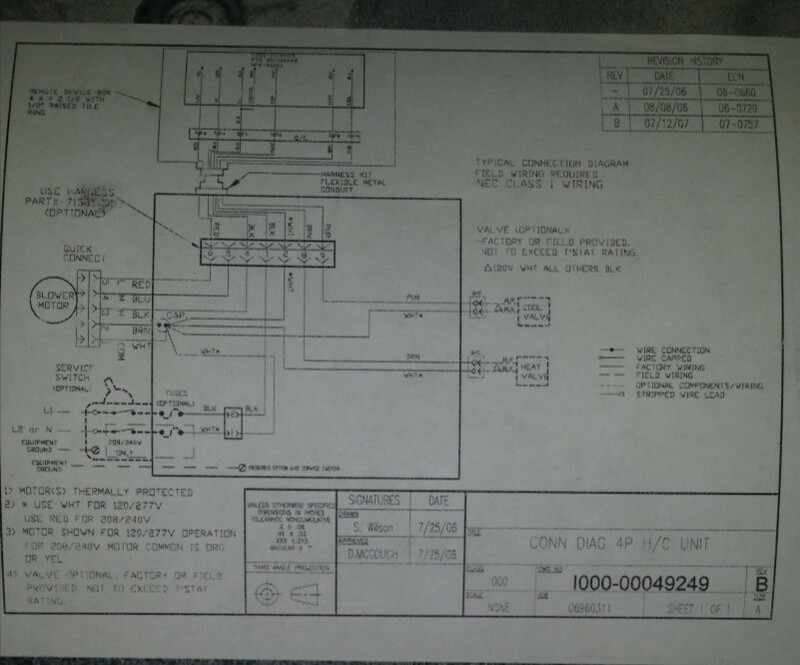 Here’s the wiring diagram, which falsely led me to believe it was a 240V system (more on that later). The diagram was handy as I planned my relays and transformer fun. 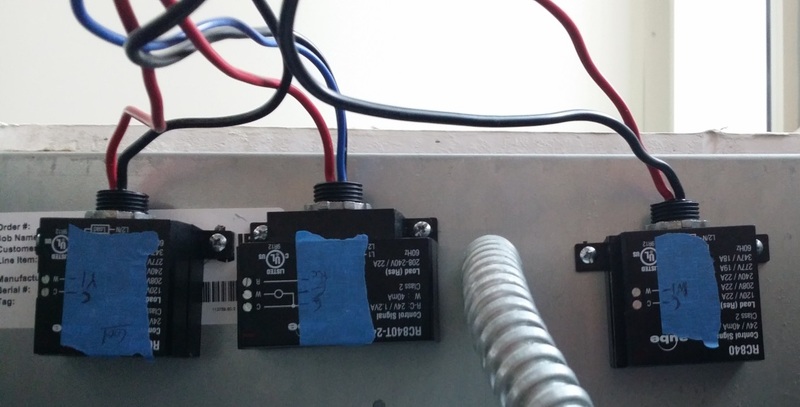 With three 240V circuits to control from the 24V Nest, I needed three 240V to 24V relays. I chose the Aube (Honeywell) RC840, sold by SmartHome.com. I also needed a 240V/24V transformer to power the nest. Easy, replace one of the relays with a relay + built in transformer, the RC840T by Aube. At some point, the planning ends, and you have to jump in. This is the essence of what our startup CEOs do and why I love working with them. Find something that needs fixing and fix it. Or maybe break something that works and make it better. This was my chance to do the same. Note: If you are considering doing something like this on your own, convince yourself not to. Should you not listen to yourself, be careful!! High voltage can kill you. Turn your breakers off!! The two relays, relay + transformer and nest arrived from SmartHome and Amazon in three days. I spent a few hours the next Saturday mapping out the wiring. Then Sunday morning: **Snip**. That was the sound of my wire cutters bifurcating the wire harness to the old thermostat. I was committed. No going back. Some drilling to mount the relays, stripping and capping wires, and I had the high voltage side hooked up. In the closeup above, you see the terminal designations for the low voltage side connections to nest. All of this took four hours or so. I go slow when I don’t know what I’m doing (and when playing with high voltage). So it’s 3pm now. The winter sun is falling low, and polar vortex 3 is in full force outside. Will the kids have heat tonight? My system is all wired up. 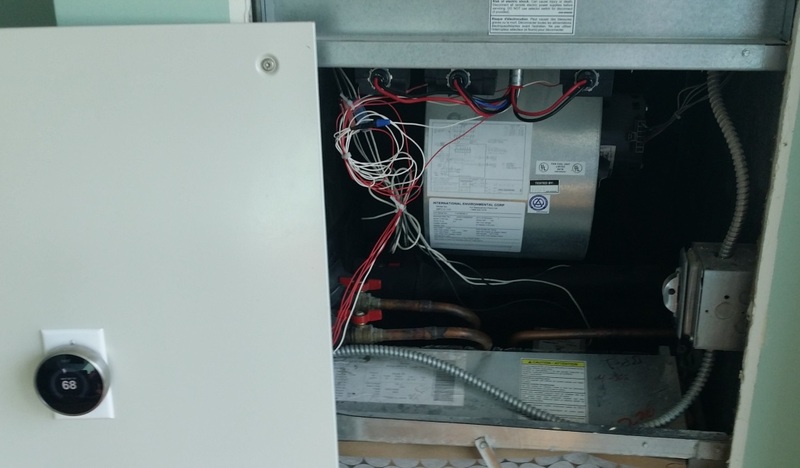 Flip the breaker switch and turn on the nest. I go through the setup process – wicked simple. Should be ready to roll. With my kid, cat and wife watching, I turn the nest to engage heat. Nothing. Doh! Fiddle, rewire, fiddle, rewire. The relays have an indicator light that is supposed to light up when called by nest. The heat and fan relay indicators are lighting up when I call for heat, but the fan and valves aren’t engaging. Hmmm, the relay lights are actually quite dim. Uh oh. The system isn’t 240V; it’s 120V. The power going through nest from the transformer+relay and delivered to drive the other relays is ½ of what it should be, 12V not 24V. Not strong enough to trigger the load circuits. Oops. There are a variety of reasons I should have known this before, but let’s not let thinking get in the way of action. Choices: no heat for a few days while I order a 120/24V transformer online. Or pray for an option at Home Depot or RadioShack. Both had a number of options online, but local stocking was not looking promising. Through growing piles of tools, wire cuttings and now more cursing, Ashley is her amazing, beautiful, patient self. “See ya, headed to Home Depot,” I say, not letting onto my failure. 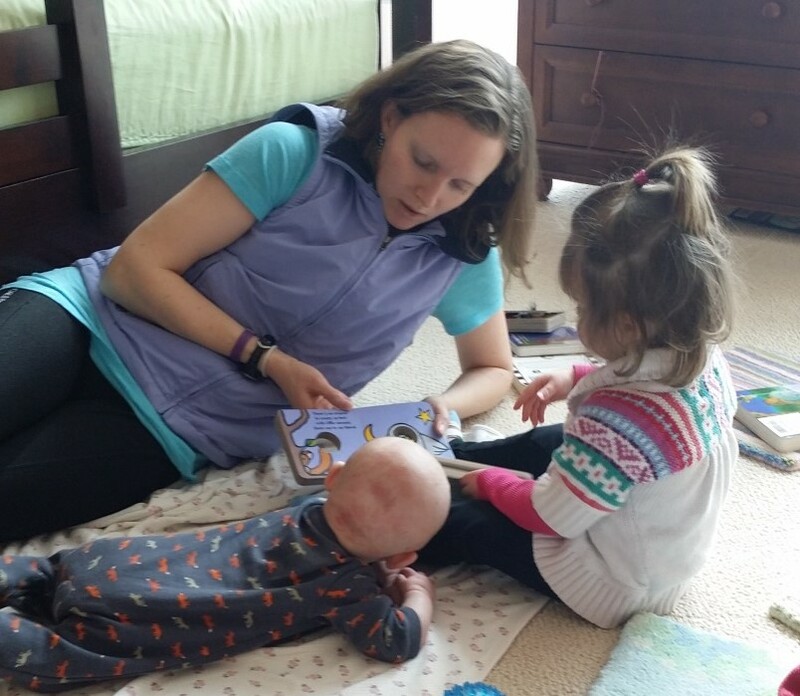 She smiles back and has the kids huddled together for warmth reading a book. We both know she knows what’s going on. I have so far not helped at all with the kids the whole day as I pursue my dreams of building and making. Sound familiar? Yup, makes me appreciate the wildly supportive spouses, families and friends who back our entrepreneurs as they make their own dreams come true. Home Depot was a total strike out – no transformers or relays in store at all. I guess this isn’t shocking – like most retailers, they are now focused on selling stuff that is too big to ship to your door or stuff that you need today. In the old days, you could assemble a computer with parts from RadioShack, so I gave them a shot. I walked in and was pretty sure I was the only customer they had seen all day. There was one of every SKU on the wall – yes exactly one – evidence of a failing retail model desperately clamping down on working capital. I asked if they had 120V to 24V AC transformers. “nope”. I refused to believe him. I couldn’t. This was my only chance not to sleep on the couch that night. So I spent 20 minutes looking around. On a bottom shelf in the back corner, I found a dust covered 120/24V transformer in a package that looked like it had been opened and re-closed with staples six times. Sold. But what if I had needed three or had actually listened to the sales associate who said they didn’t have any? Retailers are in trouble. It was not a surprise a few days later when I saw that RadioShack was planning to close 20% of its stores. Take two: If you hadn’t failed the first time, would you have enjoyed the second time as much? More drilling, wire cutting and an hour later, I’ve got my new setup wired together and ready for testing. The updated wiring diagram looks like the following – notice addition of a separate transformer. With another component, the inside of my fan coil now looks a bit like Medusa. But ready to test nonetheless. Service: It’s not just what you do, but how you do it. If you’ve ever called an electronics or cable company for service, you know how painful it is. Cable and utility companies have an excuse – they are near monopolies – they don’t need to provide good service to keep you as a customer. There is no excuse for electronics companies. Apple figured this out and has led the way in being the “zappos” of electronics. No warranty? No problem. We’ll fix the screen (we know you’ll be back for more). 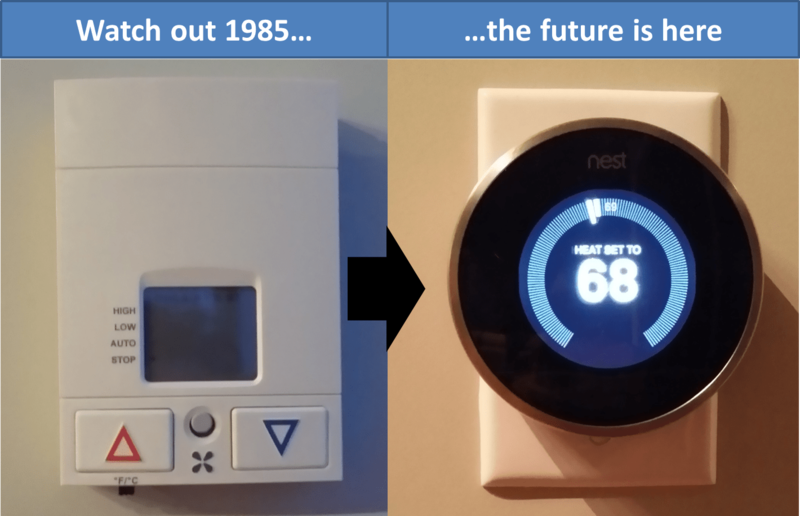 Nest has followed Apple’s lead. I got a service tech on the phone immediately… at 4:30pm… on a Sunday. Wow. But you’ll recall I was installing nest onto a system that nest says it specifically does not support. I was 90% sure they would immediately say they couldn’t help me. 15 minutes later after elevating to a second tier service tech, we had everything working. Not once did they mention that my system wasn’t supported. They just helped me make it work, and they were wildly nice and polite… the kind of guys I’d want to have a bourbon with, the kind of people I would welcome into my home. Glad I did. Contrast this with my having tried every other internet service to avoid using Comcast because of how they treat customers. Here is the system all packaged up with zip ties, tape and better connectors. Cherry on top. It has worked amazingly well. We never have to touch it. It just works. So??? With an estimated penetration of less than 5% in a slowly adopting durables market, it seems like home automation should be up for grabs by lots of players. Plenty have their eyes and efforts on the home automation SaaS opportunity besides Google – ADT, Xfinity/Comcast and others who have been in homes for decades – with paid subscription models. The problem for these players is they are woefully under-prepared to compete with Google. My nest installation is one small step for my family, but one big step for Google. Google knows pretty much everything about me and also know how to generate value from that data. ADT and Xfinity have no idea how to do this. Soon, these older-players-trying-to-rethink-themselves will be competing with Google’s free or near-free software offerings that monetize me via ads or affiliate marketing revenue. On top of that, Google will provide better service and garner more trust. Google’s android took the smartphone market very fast, and I expect Google to do the same in the home (adjusted for a much slower evolving housing market, of course). There will be a role for startups that have hardware and software ancillaries that Google and desperate competitors want to buy, but real market ownership by an emerging startup is very unlikely.